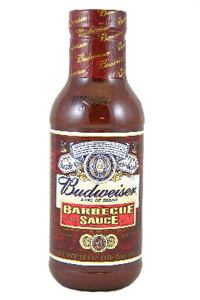 Budweiser BBQ Sauce is made from the finest of ingredients, just the like the finest beer in America, BUDWEISER! Made with the same barley and hops used to make cold beer, Budweiser Barbeque is perfect for grilling chicken, beef, pork or sausage. Budweiser is all about perfection and this sauce fits right in! ngredients: Water, distilled vinegar, Budweiser beer (water, barley, rice, malt, hops), tomato paste, high fructose corn syrup, molasses, mustard (vinegar, water, mustard seed, salt, turmeric, paprika, spices, garlic powder), honey, onions, modified corn starch, salt, minced garlic (dehydrated), sugar, butter flavor (milk), apple concentrate, dextrin (rice, dextrose, red pepper, caramel (color), red 40 (color), potassium sorbate, sodium benzoate, spices, spice extractive, annato (color).